Another successful solution was offered for Factory Acceptance Tests at DESCON Dubai facilities for Control Panel on 16 May 2017. Interface point unit complete with IP54 GRP kiosk including tap, sink, 24 V DC UPS supply system (3 Hours back-up batter), sockets, hygrometer /thermostat, space heaters, panel lights, door operated switches, terminal blocks, MCBs racks, according to drawings & specifications. MID size redundant programmable logic controller with 15″ human machine interface (Industrial HMI), power supply, communication module, with required I/O cards for interfacing with flow, pressure signals, valve status/command and other signals required as per the specification and to be mounted in interface point GRP metering panel (Kiosk). 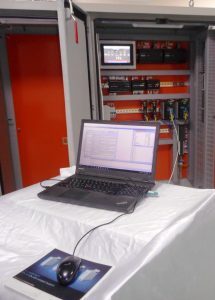 Configuration, testing and commissioning of mid sized redundant PLC system, operator interface touch HMI, interface/ communication equipment.